The perfume Emporio Armani Diamonds for Men arrived on the market in August 2008. 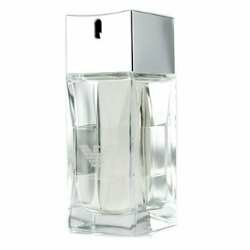 Its bottle was designed by Giorgio Armani himself, and it has a square-shaped bottle like a square-cut diamond. Name of the perfume and shape of the bottle is a real challenge for producers, designers and market, since diamonds are always attributed to women, as if they belonged only to them. EA Diamonds for Men was created Jacques Cavallier of Firmenich. It contains gourmet-woody aromatic juicy, with an unusual gourmet reversal in the top notes. The perfume opens with sparkling, sweet aromas of bergamot, with Guaiac, vetiver, cedar, Szechuan pepper, cocoa and ambroxan.